Posted on 2/4/2011, 9:00 pm, by SoCraftyTal, under Handmade Gift Ideas, Holidays. 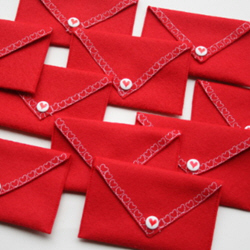 These wool felt heart envelopes by Maurer are adorable AND easy to make! Gather some wool felt, heart snaps and a sewing machine for the heart stitch accents. Fill these little envelopes with handmade heart crayons or lollipops! For more handmade Valentine’s Day card and gift ideas check out the Valentine’s Day projects here. What a smart and cool idea! I just recommended it to the editors.